Blazon: In front of a Maple Leaf Or a Crane rising Argent. Link: The maple leaf commemorates the RCAF units which used the airfield in 1943-46. 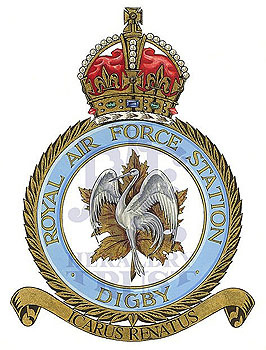 The crane comes from the Arms of Cranwell and alludes to the fact that Digby was used in 1917 as an overflow station for RNAS cadets from Cranwell. Motto: Latin: Icarus renatus– Icarus reborn. Sponsored by Ivon Nigel Moore and dedicated to all who served at RAF Station Digby.